EarthSky Tonight—Nov 26, Can you see the different colors of the stars? The stars are like wildflowers, in that each star radiates with a different color of the rainbow. Have you ever noticed star colors? Let’s explore some of the stars that you will see in the meadow of night tonight. In the northeastern sky at evening shines a bright star called Capella, the Little She Goat, in the constellation Auriga. Like brighter Sirius, which does not rise until several hours later in the southeast, Capella often flickers madly when low in the sky. This effect has nothing to do with the star itself but rather is caused by Earth’s turbulent atmosphere. 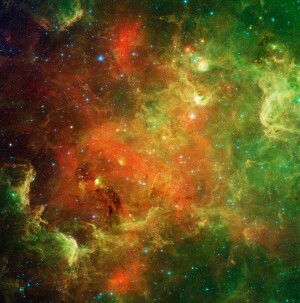 The effect is particularly prominent with Capella because this star is so bright. It is the sixth brightest star in the sky. If you have good eyesight and a dark, clear sky, you should be able to detect hints of color with the brighter stars. If you have difficulty discerning star colors with the unaided eye, try looking at these stars with binoculars. Contrast Capella with Aldebaran, shining in the constellation Taurus to the right, and to the stars of the misty Pleiades cluster higher up. The light from a star reveals many things, but most directly the stars’ surface temperatures. The yellowish color of Capella indicates a mid-range surface temperature, much like our sun. The red of Aldebaran is typical of the lower surface temperature of an older star, whereas the blue of the Pleiades reveals their high surface temperature and young age. 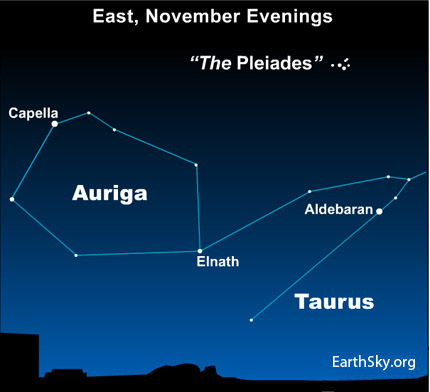 The blue-white star Elnath, by the way, is officially part of Taurus, but it typically is considered part of Auriga as well. There is a whole spectrum of stellar color sparkling in the sky tonight, from cool red stars to hot blue-white ones, and middle range yellow stars!